Pappea capensis, the jacket plum, is a long-lived, hardy, evergreen, small to medium tree. A great favourite with birds. Pappea capensis, the jacket plum, is a long-lived, hardy, evergreen, small to medium tree. The leaves are simple, hard-textured and wavy. 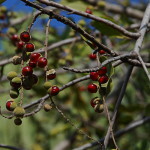 The greenish flowers are borne on catkins, followed by round green velvety fruits which split open to reveal bright red flesh with a dark brown to black seed imbedded within. Pappea capensis is a great favourite with birds that relish the red fleshy seeds.